This topology layout is based on the new physical topology presented here. 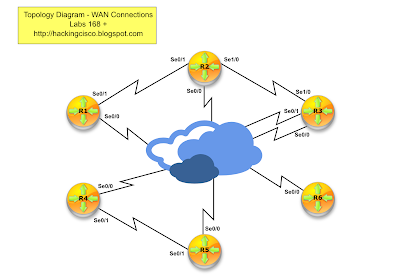 In previous lab (Lab 168) I have configured basic L3 reachability (point-to-point) as well as OSPF configuration in the core of the network (R1, R2, R3, SW3). Enable Multiprotocol BGP on all PE routers. Configure standard protocol used in MPLS networks on all PE and P routers. Make sure that PE routers do NOT run tagging protocol on their interfaces facing the customers. Using the physical topology presented here configure the IP addressing according to the following diagram. Make sure that all routers and switches can ping each other on a point-to-point basis (All loopbacks use 10.0.x.x/24 addresses where x=router number, sw1=7, sw2=8 etc.). Pic. 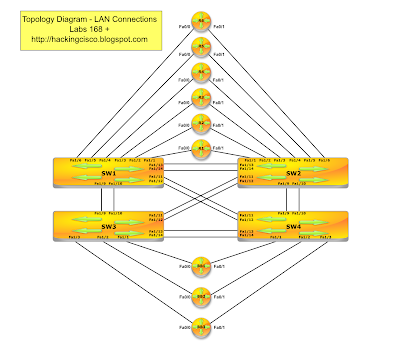 1 - MPLS Topology Diagram. Once devices can ping each other on a point-to-point basis, enable OSPF on links between R1, R2, R3 and SW3 (core of our MPLS network) Advertise loopback addresses as /32 prefixes. Use AREA 0. In my next lab we're going to create MPLS basic configuration. After a looong hiatus regarding my blog updates I come back with new set of mini labs and new topology. Please, watch the video introduction to get familiar with some changes in the blog. Pic. 1 - LAN Connections. Pic. 2 - WAN Connections. If you use dynamips+dynagen on Linux (like myself) you might find the following topology file useful (keep in mind I start TWO instances of the dynamips hypervisor to off load the CPU). My next series of mini-labs (starting with Lab 168) will use the above layout until further notice.